When they came, they came in force!! 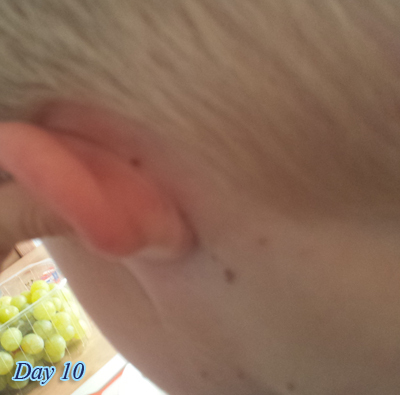 Day 1 and you just know that spot, that spot right there looking a bit pus filled, rather round and looking NOTHING like a white head... that could well be the start, and then within the hour of seeing that one spot on the back of the neck, a friend appears near the ear. My boy is in good spirits, he's happy, laughing, driving me crazy so maybe that's just a spot......check the tummy. Oh here we have 3 spots that seem to appear before my eyes and off to the chemist I go to get some Calamine location and top up on Calpol. Day 2 and we have a few more spots appearing what feels like every few hours! 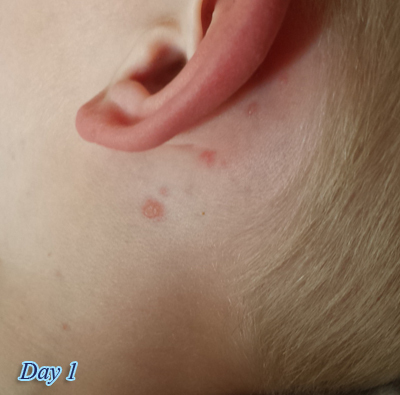 The spots have also starting to appear in my boy's scalp and this was causing him to scratch his head quite fiercely . I managed to get him to stop scratching but he replaced it with rubbing or 'stroking' as he called it. 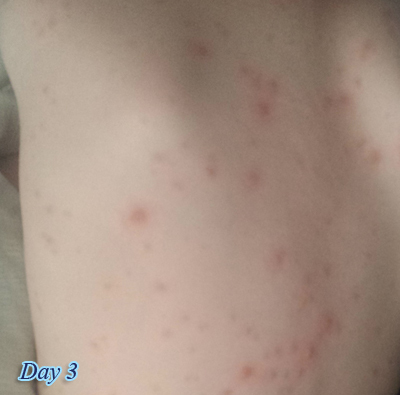 Day 3 and by the afternoon my boy was starting to feel the effects of chicken pox. We had spent the morning in the fresh air and had a picnic out in the garden but by early afternoon the effects had started to take its toll. My boy spent the afternoon confused, complaining of a soar throat and generally being uncomfortable in his own skin. He slept at random points in the day, drank lots and lots of water and spent the afternoon having lots of cuddles and love. Day 4 was the worst day for my boy, he was very quiet and spent most of the day watching Harry Potter in bed. Spots had started to appear in his mouth and on his lips and making it difficult for him to smile. He continued to be confused and uncomfortable and spent most of his time in just his pants. He did seemed to enjoying putting the cream on and welcomed his Calpol today. 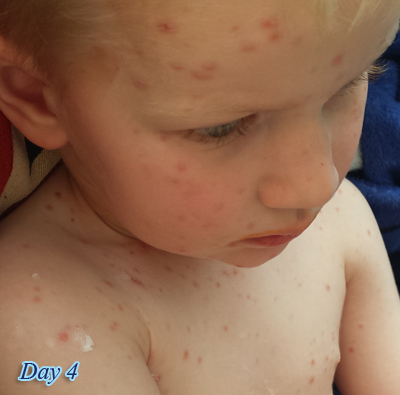 For me, this was my worst day of Max's chicken pox. I know how that sounds, and it's not about me, but it is, it's about me, my partner and my son. It's about us, as his parents helpless and just being put on the sideline whilst our baby boy suffers with this horrid disease. My boy was really struggling this day with his throat. I called the doctor and was told to continue to keep him cool, give him cream for the itching and Calpol for temperature but if I was concerned to bring him in. Day 5 and the first of the spots have started to scab over - thank goodness, but we are also getting new ones just starting to blister. Max has started to feel better in himself today but still contagious and so restricted to our garden and grandad's garden. Day 5 old pox scabbing and new ones still coming out. Day 6 and my boy is back to himself within himself, such a relief to me, he can drive me batty as much as he likes right now! Still waiting for the last spot to scab over before taking him out, and it is the quarantine period that is now starting to take its toll on him. Finally on Day 8 the last of the spots that came out - which was on his feet and some rather large ones at that, finally decided it was time to scab over and allow us all to go out and about again!! Day 11 and slowly fading away. 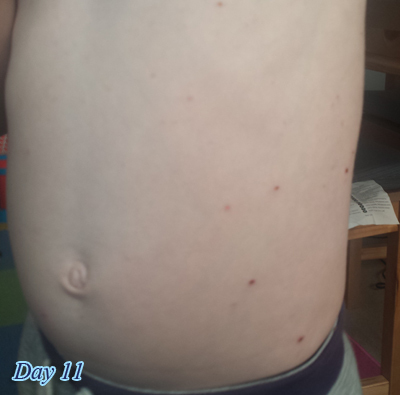 Day 14 and the first of the spots are finally beginning to fade away. We have had a horrid time with these spots. Apparently I had it really bad when I was a child but I don't remember, all I remember is being promised a pull along telephone if I didn't pick any of my spots - and you know what, in cases like this I'm all for bribery! 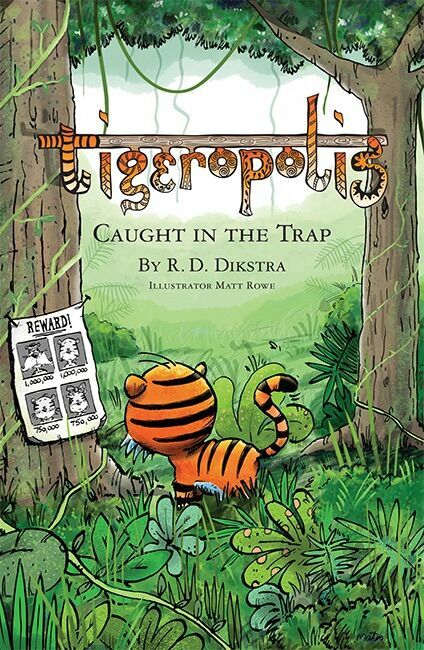 I never picked my spots and my son hasn't picked his! 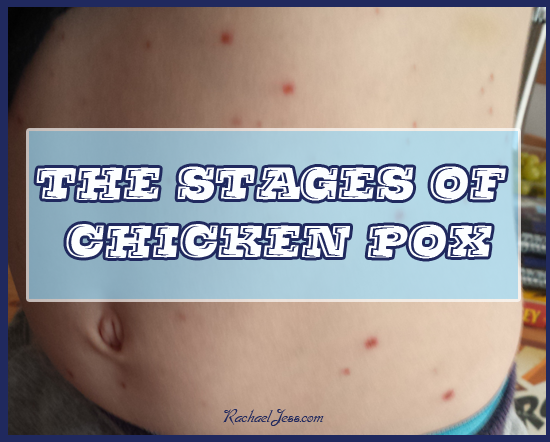 I've summarised below the stages of my boy's chicken pox - it was not a pleasant couple of weeks, but crafting, movies and lots and lots of love got us through it. 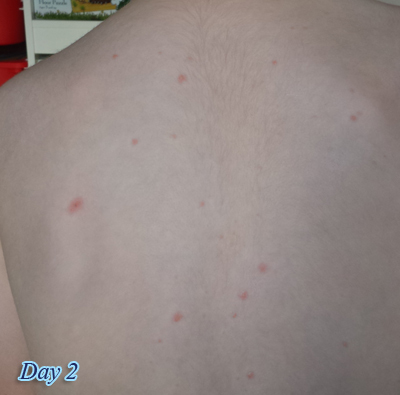 Apparently Nursery would only allow my son back when the last of the spots scabbed over! So on day 5 we still had new ones coming out! He was off around 2 weeks in total. Great job documenting the stages. We are on day 4 and thanks to this blog, I knew I could expect this to be the worst of it. I've been documenting our experience for any friends or family that get it so they have an idea how it progresses but have also sent links to your blog for reference. Thank you! Brilliant timeline. Really useful and not scaremongering like a lot of people. My daughter is on day 2 and I'm on day 1 by the looks of it. Yes we both have it. She is 1 and I'm 30. 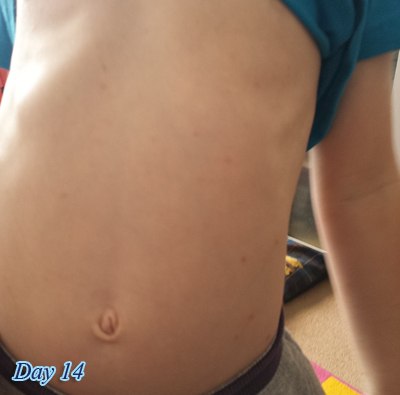 Thank you for your blog.My son is on day 5 and they are drying out nicely with the help of bicarbonate of soda in the bath.It has been hell for him in 30 degree heat. I'm an adult but thanks for this log!!! Having reached day 4 i just hit the internet to find out how many more days this is going to get worse for!! Reassuring to read you blog and see your photos which are very similar to my little girl and also know that we are hopefully at the worst and things will hopefully start improving soon. My son has just come out in spots, so I’ve been mad googling. This is by far the best thing I’ve found. Good to know that when we get to the worst of it there’s really only a couple of days left! I’ll keep reminding myself of this when we are deep in it! Thank you! My son has just come out in spots so I have been manically googling. 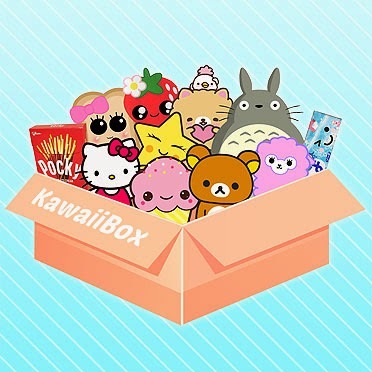 This is by far the best thing I’ve found. So thanks for documenting! She is running around wild. 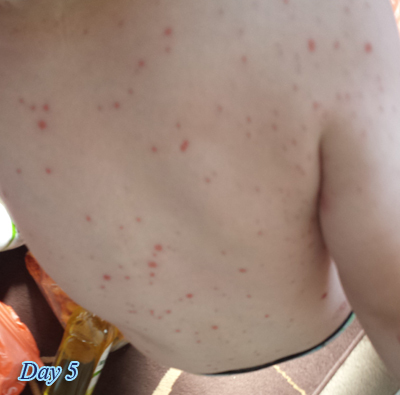 Slight fever today but unless you saw the spots on her back you wouldn't think there's anything wrong. This is the second time for us as 12 days ago my 6 year old had it. She was unwell for 48 hrs before any spots appeared and by day 3 in the afternoon was starting to feel unwell. 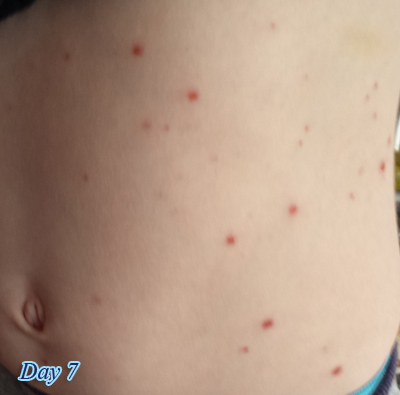 Then day 4 and 5 she broke out a lot more complained of feeling sick with a headache etc. By day 7 she was over it with most starting to scab and no new break outs. I knew my toddler would get it soon. Thank you very much Laura, much appreciated. My daughter is 6 months old. 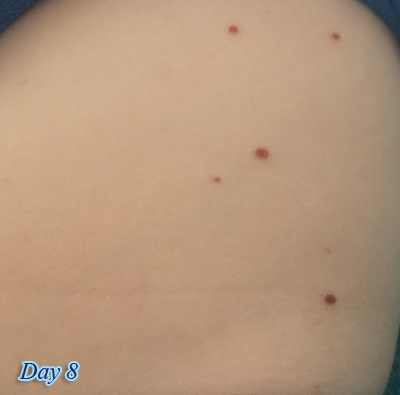 I got the spots all over I am on day2. She started with the first spot today. She didn't get her vaccine done yet as she is down with fever before. I am worried about her and she is still mother feeding. Can someone please help.